Hey there! Cooler weather has finally started to make its way to my area, and I am so excited! Fall is my favorite time of the year. The changing of the leaves, going to the mountains to pick up fresh apples, yummy apple cider, and getting to start wearing all of my comfy sweaters! Today, I have a polish from one of my favorite Indie makers, Lucky 13 Lacquer! This polish, "Accio Lacquer" just reminds me of Fall. 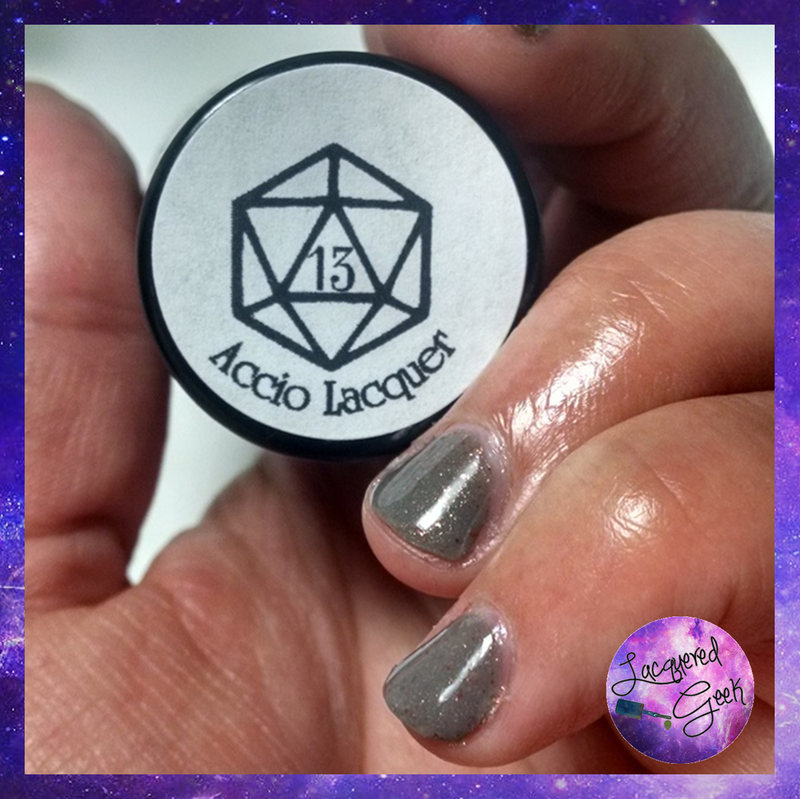 Accio Lacquer was made in conjunction with one of my favorite bloggers, Mishka from Accio Lacquer. She was one of the first bloggers that I started following. Her posts made me laugh, and she reviewed polishes from fandoms that I love. It was through her blog that I found out about Lucky 13 Lacquer! Combine one of my favorite bloggers with one of my favorite indie makers... well, anything that came from that union was going to be a WIN! And Accio Lacquer does not fail to deliver on that expectation! It reminds me of flames flickering through the smoke from a bonfire. (Or the fiery breath of the Hungarian Horntail!) It was inspired by Harry Potter's fight with the Hungarian Horntail during the Triwizard tournament. Stone grey crelly base with hot orange, blood red, and gold microflakes. For these photos, I'm wearing 3 thin coats of polish topped with a shiny top coat. The first coat went on fairly sheer, by the second layer, the polish was pretty much opaque on my nails. I added the third coat mainly for more depth. There were no issues with the formula at all! aww.. your nails look so cute, my sister's look so similar! This polish looks really great on you!